Wanted to share some pics. Tonight was a good night. I was nervous. Very nervous. 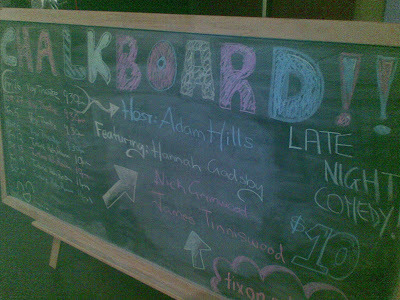 I was lucky enough to be offered a 5 min spot at the Brisbane Comedy Festival Chalkboard show - the 'best of' show of the acts at the Festival and the Brisbane comedy scene - like the Festival Club in Melbourne, except only $10, not as late and without the resident DJ pumping tunes till 3AM. There is also no 'silent disco'. But I didn't know until today that I'd be sharing the same bill as bigtimers Adam Hills and Hannah Gadsby, plus wickedly acerbically physically comedically destined-to-be-a-bigtimer superdude Nick Grimwood. Did I mention I was nervous? Oh. Well, I was. Objectively, I think I did okay. Not the best I've done and not shithouse - it was okay. I mean, who am I kidding? There are 150+ people here to see Adam and Hannah - not me. As far as they're concerned, this nobody is eating up Adam's stage time. I saw disapproving looks. So I think I did okay for a guy who was following Adam Hills. Great crowd though. Festival crowds are quite cool. Adam, Hannah and Nick all, naturally, killed. Even if I felt it was a so-so performance, it was a night where I got recognized by people. This does not happen. Ever. But it did tonight. And the funny thing was, I wasn't recognized for tonight's performance. First, the Powerhouse security guard remembered me from Livewired a few weeks back. Then afterwards, I was recognized in Hungry Jacks in the city by an acquaintance with mutual friends who tried out comedy some time ago. Finally, walking to the bus with squished Whopper minus pickle and onion in hand, I got recognized by a group of really friendly uni students waiting for a bus. 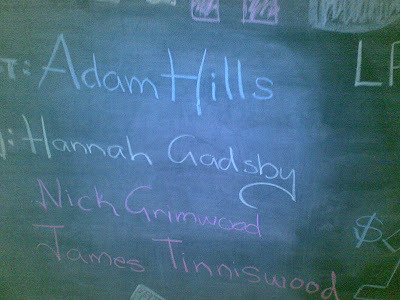 They knew I was the 'Anne Hathaway' guy and said well done. They seemed genuine. I said thank you and asked if they'd just seen the Powerhouse show and, no, it turns out they were part of the big QUT O-Week contingent which descended upon Newmarket a few weeks back for the open mic night. That was a very good night for a lot of the acts - I had a lot of fun both watching and performing that night. They ended up catching the same bus as me and we chatted for about 10 minutes till they got off at Kelvin Grove. I felt incredibly flattered. I got called a 'comedian'. It felt weird. So it was a good night. I go to sleep with hope. Even if I felt it was an average gig for me personally, it was immediately followed by a reminder that I am doing stuff people like and remember. And that's encouraging. 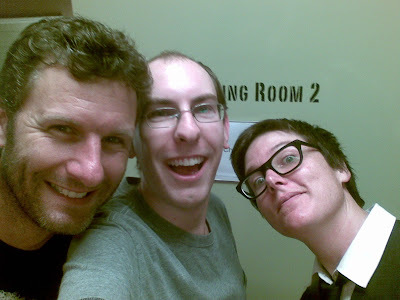 Also, Kitty Flanagan was hanging around backstage for a bit, but I didn't get to talk to her. She has lovely eyes though. Please get out and support the Brisbane Comedy Festival - http://www.briscomfest.com/ - especially the shows by locals Greg, Mel and Harley. If the few local acts are left overlooked in the light of the big ticket acts like Adam, Wil, Kitty, etc. then the Festival won't be able spread its net wider in the community and take chances on lesser known but talented acts.